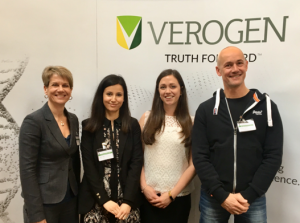 Prof. Walther Parson stopped by the Verogen exhibit stand for a chat with our staff, Nicola Oldroyd Clark, Sarah Naif, and Laurence Devesse (from left to right). In 2014, Illumina hosted its first workshop dedicated entirely to the potential offered by Massively Parallel Sequencing for forensic applications, in conjunction with the 34 Spurenworkshop in Innsbruck. Professor Walther Parson, Institute of Legal Medicine Innsbruck, presented on the use of MPS methods to expand the utility of mitochondrial DNA sequencing methods. Five years later, the 38 Spurenworkshop in Basel witnessed another milestone – the first MPS workshop hosted by the new company now responsible for the present and future of Illumina’s Forensic Genomics Business, Verogen. The workshop showcased how MPS methods are becoming a reality for forensic applications and highlighted cutting edge research focused on expanded use of MPS for both routine and specialized investigations. Laurence Devesse (Forensic Applications Specialist at Verogen and PhD student at King’s College London) presented on the significant impact and utilisation of sequence variation in autosomal STR markers. 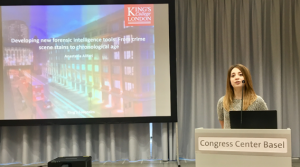 Anastasia Aliferi (also a PhD student at King’s College London) shared recent advances in the identification of epigenetic markers specific to chronological age, and how such tools could be ultimately developed to provide age estimation of the donor of a forensic evidence sample. Through the efforts of the forensic community and the Forensic Genomics team at Illumina, the last 5 years have witnessed major progress towards the implementation of powerful new technologies into the forensic laboratory. Verogen was formed specifically to continue and deepen this spirit of cooperation, and thus develop the tools and services required to truly transform the capabilities of today’s forensic scientists.